This used to be the perfered route down the Gulf Coast to Yucatan. Today, it is little-used, because it is almost all libre roads and some believe it to be less safe than the Laredo route. Still for those who want to go this way it is a more lesiurely drive and has some interesting sights. There are enough RV parks that you won't have to boondock. At Veracruz city, you have a choice. You can connect with the Laredo route and bypass the Tuxtlas scenic region and stay on a nice toll road to Acayucan. OR, you can keep south on the scenic Gulf road south of Veracruz city. If so, you will see wonderful sights like Eyipantla Falls. 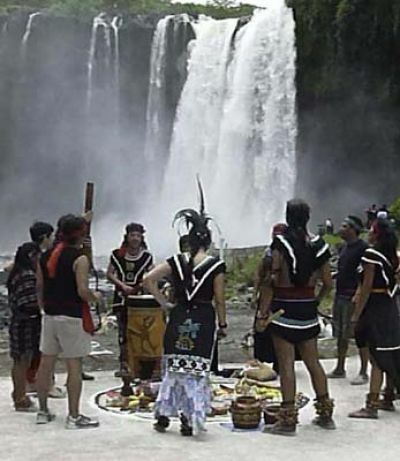 Tlaloc the Nahuatl & Aztec god of rain made his home at these falls and you might see worshipers. There are 245 steps from the parking area down to the falls. Some are very steep and there is no shame in taking it slow. There are benches to rest. The falls are 120 feet wide and 180 feet tall. Eyipantla translates to three furrows in English. Movies have been shot here and in Catemaco area, Apocalypto being one. The cigar center of Mexico is in San Andres Tuxtla. Witches enclaves (and conventions) are in Catemaco and Santiago Tuxtla.